Participants in the Russian March in Moscow's Lyublino. 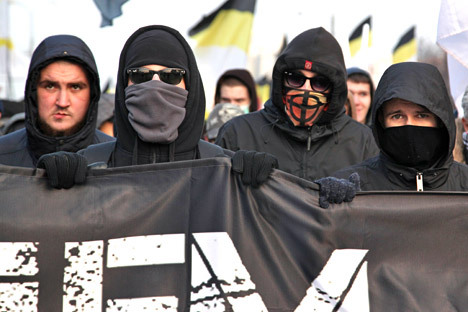 The Russian government has imposed a temporary ban on the association of Russian nationalists, with the prosecutor’s office demanding that it be recognized as extremist. RIR asks people what is happening with the nationalist movement in Russia, and why it is now the government's "new enemy." It appeared a couple of years ago that the Kremlin and Russia’s various nationalist groups were, if not a happy couple, at least content to be in the same room. Their shared conservative values and staunch championing of all things “Russian” made them natural allies. But since the crisis began in Ukraine in early 2014, this cosy relationship has unravelled. The Moscow Prosecutor's Office temporarily suspended the activity of the Russkiye (“Russians”) nationalist movement in August, urging the courts to recognize it as extremist and ban it in Russia. According to the prosecutor's office, the reason they have sought suspension is because documents show that the movement's plans are "aimed at inciting enmity" towards people based on their nationality and "contain calls for a national liberation fight to create a Russian national state." Russkiye leader Dmitry Demushkin, against whom a lawsuit has been filed, said he was waiting to be arrested "for some fictitious act," while Alexander Belov, another nationalist leader, is waiting to be sentenced to a jail term. While nationalists believe their ranks are being purged, analysts are inclined to call it a "progressive decline." They point out that the nationalists have been unable to recover from the inner schism that divided the movement after the conflict in Ukraine began in 2014. The split resulted in a significant part of the association proclaiming support for the pro-Russian rebels in eastern Ukraine’s Donbass region, while another section sided with Kiev, under the slogan of Russian-Ukrainian Slavic unity. During the 2014 Russian march, a now-traditional annual rally for Russian nationalists organized in major cities across the country, they divided themselves into two columns. Analysts, however, say it was not Ukraine alone which caused the crisis in the movement. The fact that the Russian nationalist movement is in decline today is something not only detached observers believe, but even the movement's ideologues accept. "The movement doesn't have any political perspective, practically the entire field has been burned and the security forces are finishing off the wounded," said Demushkin, who believes the authorities decided to mop up the nationalists "just in case." According to Demushkin, the government is afraid that radical nationalists may join forces with anti-government protesters. "By themselves, it seems, they do not represent a danger. They've become rather silent. But when they return from the Donbass to Russia, this is a potential threat," said Alexander Verkhovsky, director of the Sova analytical centre and a specialist on nationalism and xenophobia. "Until 2010 the Russian nationalists inclusively were never against the government,@ he said. “But then our organizations were banned (the Slavic Union and the Slavic Force groups are recognized as extremists – RIR) and lawsuits were filed against the organizations' leaders, first just one-time cases, now more and more often. Looking forward, none of the observers interviewed by RIR were unable to say exactly what will become of the sapped nationalist movement in the future. "Last year the demonstration gathered a minimal number of people [1,500, according to the police – RIR], even though in better times the march would gather about 10,000 people," he said. "Russia for Russians": what's behind this nationalist slogan?